In observance of Asian Pacific American Heritage Month, KCET-TV has announced two “Local Heroes” from Los Angeles’ APA community, Nobuko Miyamoto and Sosei Shizuye Matsumoto. • In a city where cultures often collide, Nobuko Miyamoto, artistic director and founder of Great Leap, has set out to harmonize relations through the use of the performing arts. Initially, Miyamoto founded Great Leap in 1978 to fill the lack of creative productions that addressed Asian American culture. At the time, no such organization served that purpose in Los Angeles. This groundbreaking move gave the region’s Asian American community a new voice in musical theater with productions such as “Chop Suey” and “Journey in Three Movements.” Creative workshops for the youth and adults were introduced. Miyamoto also recorded “Best of Both Worlds,” a solo album that told the Asian American story. Then came the Los Angeles Riots in 1992. After she witnessed the tension that the riots triggered, Miyamoto decided to address the issue. She took what could be considered a great leap and introduced a variety of cultures and faiths to the organization’s creative repertoire. What resulted was the Great Leap of today — a multicultural arts organization that uses art as both performance and creative practice to deepen relations among people of diverse cultures and faiths. The touring show “A Slice of Rice” became “A Slice of Rice, Frijoles, and Greens.” Creative workshops such as “Memories of Boyle Heights” brought together Latinos, Jewish and Japanese people. Miyamoto’s second solo album, “To All Relations,” followed suit. With 35 years of leading Great Leap, Miyamoto’s impassioned reaction to the issues of today continues at age 73. After the 9/11 attacks, she developed “Art of Weaving Faiths,” a creative workshop that brought people of different faiths together that helped heal the wounds of the tragedy. Environmental issues are another hot topic. Miyamoto launched environmentally themed performances and three music videos, such as “BYO Chopsticks,” which was inspired by the throwaway wooden chopsticks found at Asian restaurants, and “Cycles of Change,” which encouraged the use of cycling rather than driving. Miyamoto has selflessly volunteered countless hours to Great Leap. Although she is the artistic director and founder, she is classified as a part-time employee. She would rather apply any additional funds to foster new talent, hire administrators and apply monies to Great Leap’s exceptional residency and mentorship programs, such as COLLABORATORY, a series of eight-week artist mentorship programs culminating in performances with a community theme. She also donates her talent to developing arts organizations, such as Los Angeles’ Vietnamese American arts group, Club ‘O Noodles. Miyamoto has taught and led workshops at many universities, including UCLA and Columbia University Teachers College. She has received several awards, including the California Arts Council Director’s Award in 2006 and the Ford Foundation’s Leadership for a Changing World award in 2003. • Japanese tea ceremony master Sosei Shizuye Matsumoto has paved the way for the preservation and recognition of the Japanese art form known as chado, or “way of tea,” in the United States. At 93 years old, Matsumoto is considered to be the most influential teacher and accomplished master of tea in the U.S. She continues to enrich the nation’s cultural fabric by teaching her students the hundreds of complex steps designed around the act of serving tea as followed by the Urasenke School. The study of tea includes four principles: harmony, respect, purity and tranquility — all encompassed in the form of serving tea to guests in a ceremony that is most often held in a tea room. Matsumoto’s classes are held in the tranquil tea room her late husband built for her in their home near downtown Los Angeles. The tea room’s serene setting, nature-inspired tea utensils, simple yet elegant decorations set the stage. The mental discipline and smoothly practiced movements harmoniously create a Zen-like atmosphere that remove the pressures of the day. Chado is considered to be the essence of Japanese art and culture. For more than 60 years, Matsumoto has instructed more than 5,000 students, some of whom are not of Japanese descent. A select few have gone on to become masters themselves. Matsumoto began her studies in chado while attending the French American Fashion Design School in Los Angeles in the late 1930s. In 1941, the Hawaii native graduated from design school and moved to Kyoto to enhance her instruction in chado. For six years, she studied under Tantansai, a 14th-generation grandmaster of the Urasenke School, and Hounsai Daisosho, a 15th-generation retired grandmaster. She now studies under the current grandmaster, Zabosai Oeimoto. In 1947, Matsumoto returned to the U.S. Enlightening the American public about chado became her personal mission. Anti-Japanese sentiment lingered since the nation was still healing from the wounds of World War II, but she persevered and soon became the go-to person for chado. She has held tea ceremonies for countless diplomats, politicians and dignitaries. 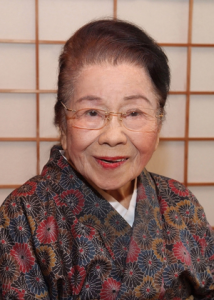 In 1951, Matsumoto witnessed world history when she was invited to hold a three-day tea ceremony during the conclusion of the U.S.-Japan peace treaty in San Francisco, serving about 3,000 guests, including President Harry S. Truman and Prime Minister Shigeru Yoshida. Since then, she has held thousands of tea ceremonies worldwide, the most recent being in 2012 at the opening of the Japanese Garden at the Huntington Library in San Marino and the Tohuku Tsunami and Earthquake Memorial at The Grove in Los Angeles. In 1968, Matsumoto was appointed to the cabinet of Urasenke School in Kyoto as a distinguished councilor for her significant contribution during the post-war era. In 1989, she received the title Meiyo Shihan, or Honored Master, from her instructor, Soshitsu Sen. This is the highest teaching certificate available for instructors. Matsumoto received the Order of the Sacred Treasure, Gold and Silver Rays from the emperor of Japan in November 1990. 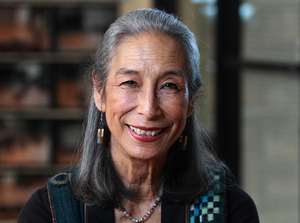 In 1994, she was named a National Heritage Fellow by the National Endowment for the Arts. In 2010, she traveled to Kyoto to receive the Urasenke Cultural Award (Chado Bunka-shou) given by the 16th– and 15th-generation tea grandmasters. This prestigious award is for those who have significantly contributed to various Japanese arts, and this marked the first time that it was given to a tea teacher. As part of its ongoing commitment to the diverse communities in Southern California, KCET, in collaboration with Union Bank, launched the annual Local Heroes Awards in celebration of national commemorative heritage months — APA Heritage Month, Black History Month, Hispanic Heritage Month, Jewish American Heritage Month, LGBT Pride Month, and Women’s History Month. The awards honor exemplary community leaders who strive to enrich the lives of others, and whose tireless contributions are inspiring hope in the minds and hearts of future generations. The year-long program introduces diverse individuals to viewers on-air and online, and culminates in October when all of the honorees are formally recognized as part of the Local Heroes Awards: Diversity Celebration. Over the past decade, KCET has showcased the remarkable stories of over 150 leaders. For profiles of past APA Local Heroes, visit www.kcet.org/socal/local_heroes/apahm/.